Sashimi Mini-Plate for Christmas at Tomii! The agnostic I am have little to do with Christmas and the New Year, except wishing for great ones to all and sundry. Actually I worked both on the 24th and 25th (and will on the 26th). Last night on my way back from University I was really starving (diet consequence as I’m already 5 kg lighter than in September!) and I had to store something into that body of mine. A quick trip to Tomii was in order. I managed to keep my hunger in check and asked for a small plate (I mean, a really small one) of sashimi. In thebackground, Kan Buri/寒鰤 or Japanese Amberjack/Five-ray Yellowtail ona bed of leaf spouts and a sprig of shiso/紫蘇 perilla flowers. 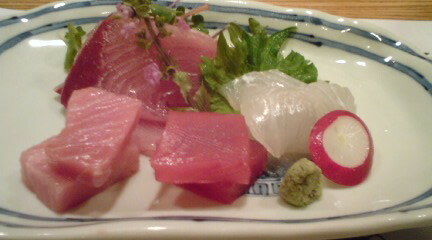 In front Honmaguro/本鮪 orBlue Fin Tuna O-toro (Belly fat part) and Akami (lean part) and Hirame/平目 or Sole/Flounder.